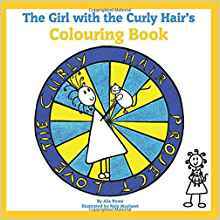 This beautiful hand illustrated colouring book tells the story of The Girl with the Curly Hair, from when she wakes up to when she goes to sleep. Make it your own – use her pictures for inspiration and ideas, and colour them in how you wish, fill out the thought bubbles with your own thoughts and add your contributions to the spaces. This beautiful hand illustrated colouring book tells the story of The Girl with the Curly Hair, from when she wakes up to when she goes to sleep. Make it your own – use her pictures for inspiration and ideas, and colour them in how you wish, fill out the thought bubbles with your own thoughts and add your contributions in the spaces. 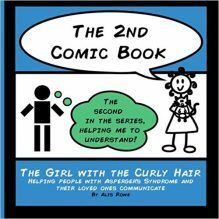 The Girl with the Curly Hair is a fictional character representing a person with Asperger’s Syndrome, an Autism Spectrum Disorder (ASD). There are lots of books about her and her experiences of living with ASD already – but here is her first colouring book. Concept, design and publication by Alis Rowe; illustrations by Nele Muylaert – two women with ASD.